CED alumni are a dedicated community, grounded in their belief that environmental design must be based on socially and environmentally sustainable principles, and bound together by their shared CED experience and commitment to the ongoing success of the college. Now, through a unique partnership with Sungevity, facilitated by the UC Berkeley University Partnership Program (UPP), CED alumni and friends have the opportunity to directly support the College of Environmental Design while also realizing the benefits of becoming more sustainable at home. Each time a member of the Berkeley CED community goes solar, Sungevity will donate a minimum of $750 back to the college. UPP provides campus units with the infrastructure to work collaboratively across the university to develop comprehensive relationships with business partners. CED became the newest benefactor of the Sungevity UPP partnership as part of Sungevity’s generous sponsorship of the 2016 Berkeley Circus Soirée. As a leader in sustainability, it is no surprise UC Berkeley chose the solar company Sungevity as the first partner of the University Partnership Program (UPP). Sungevity is a global solar energy provider focused on making it easy and affordable for homeowners and businesses to benefit from solar power. Based in Oakland, Sungevity has employed over 100+ UC Berkeley alumni since its founding in 2007. The partnership between UC Berkeley and Sungevity will help attain UC’s initiative to achieve net-zero emissions from building energy by the year 2025. In addition, throughout the 10-year term of the partnership, Sungevity will help UC Berkeley students across all disciplines develop careers in the new energy economy through internships in solar design, engineering, strategic planning, operations efficiency, marketing and finance. 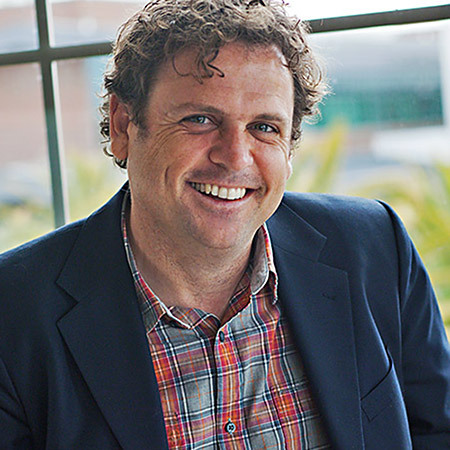 “Sungevity and Berkeley share complementary core values, both fundamentally dedicated to using innovative technologies to solve social and environmental problems,” stated Sungevity co-founder Danny Kennedy. 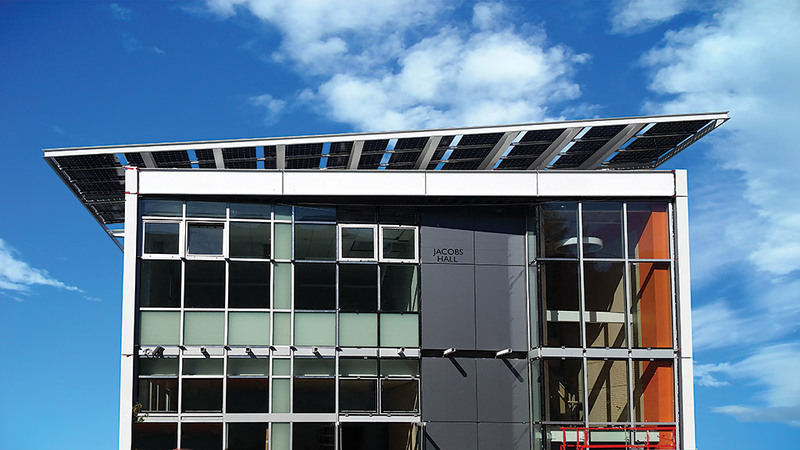 In fall of 2015, Sungevity built a cutting-edge solar system on UC Berkeley College of Engineering’s new Jacobs Hall building. 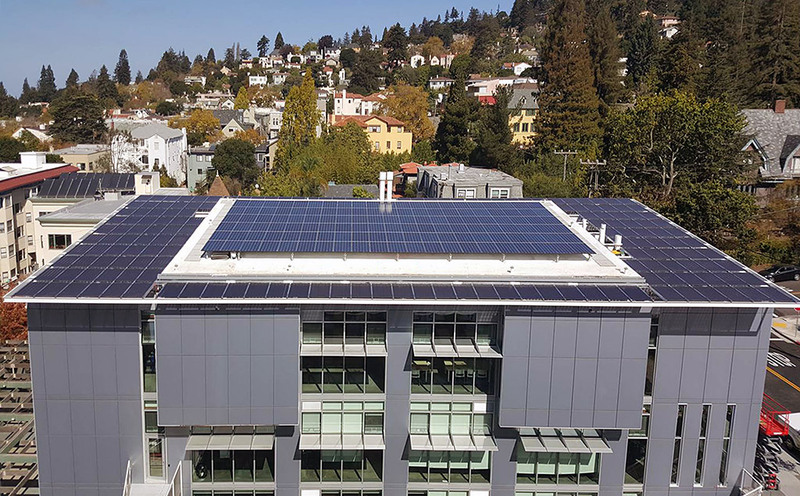 The 80.4 kW (285 panel) solar system on Jacobs Hall is now the largest solar array on the UC Berkeley campus. The Jacobs Hall installation features “bifacial panels” along the border of the building. These high-tech panels can absorb sunlight from above and below, enabling them to generate 20% more power than traditional solar panels. Over the next 20 years, the solar array is expected to produce the equivalent amount of solar energy to 597 tons of CO2. Each semester, as many as 800 students will take classes or participate in other activities in the building, and they will be able to see — in real time — how much solar electricity the system is producing on monitors throughout the building. Who knows, perhaps these students will be inspired to one day work in the renewable energy industry. Seeing solar in action on campus, encouraging the Berkeley community to adopt renewable solar solutions at home, and financially supporting the CED community are just a few of the ways UC Berkeley, CED and Sungevity are working together to build a brighter future. To go solar and take advantage of Sungevity’s $750 CED donation, start by obtaining a free solar quote for your home by visiting: www.sungevity.org/ucberkeleyced.